This will be really short. 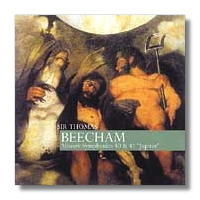 If you want the Zauberflöte you may as well get the entire opera with Beecham conducting on either Naxos [8.110127-8] or Dutton . In the case of the symphonies you are better off with Dutton's disc that also contains the "Jupiter" with the London Symphony from 1934 and the 39th from 1940. The sound on Dutton's release has more body and is smoother. The Classica D'Oro sound is somewhat shrill and tiring on the ears.